Motorcyclists love their machines. Many of my friends in the VinMoto groups have a dozen or more bikes in their garages. That same passion for the machine can be found in the work of Daniel Peirce, whose Up-N-Smoke Engine Project (named after the Texas BBQ joint where Peirce’s motorcycle club would meet) perfectly captures the beauty of the motorcycle power plant. He has photographed dozens of meticulously restored classic engines and each is really a work of art. Peirce manages to show how unique each one of them is. I know I’ll never look at an engine the same way again. High quality metallic prints of the collection can be purchased directly from Peirce in a variety of formats. I may order one for the MotoBrief.tv studio. 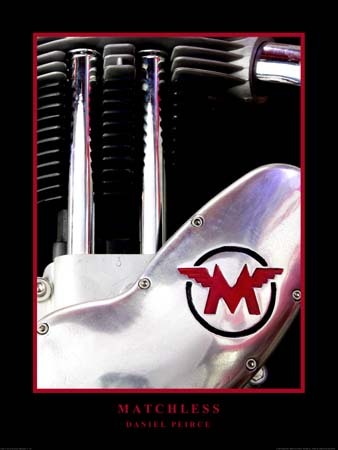 This entry was posted in Books, Motorcycling and tagged art, classic bikes, engines, motorcycle, photography. Bookmark the permalink. I’ve seen some of Mr. Peirce’s prints, and I’m delighted someone has the talent and vision to capture the true art of the motorcycle engine. A book full of these beautiful images is sure to be an instant classic. I have a couple of Mr. Peirce’s posters and they are just beautiful. I’m looking forward to the book. I’m going to buy two…one for me and one to sell on eBay someday when the book is out of print! Bill & Dave, thanks for dropping by and leaving comments. I agree that the work is fantastic. I’m looking forward to the book, too. carved a stone Matchless logo. Very cool. I like it. Why I have to be the janitor? "I promise I won't eat my dirt bike." Fjrryder on Why I have to be the janitor? curt on How Do Motorcycles Turn? Bill Chapman on How Do Motorcycles Turn?